We've been having fun seeing all the things our Joseph's Grainery Multigrain Pancake Mix can do! In addition to waffles and strawberry shortcake biscuits, DaDa figured out how to make his crepes using the pancake mix! 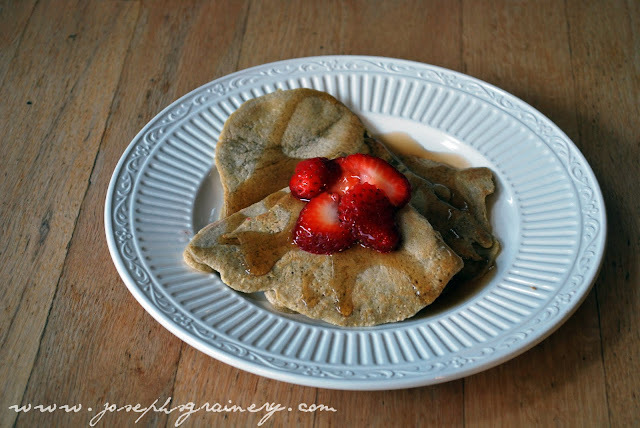 Now these aren't necessarily the light and fluffy crepes that you may be used to...they are a bit denser, but it's a fun change up to making pancake with the mix. Directions: In a medium bowl, beat the eggs, milk and vanilla together. Sift the pancake mix into the egg mixture, stirring occassionally. Once the mixture is combined, using a 1/3 cup measure, pour the batter onto a skillet over medium heat. Tilt the pan to thinly spread the batter and shape the crepe. Serve with fruit, syrup, jam, nutella or whatever your heart desires!